An art tool and video game for the Super Nintendo which contains a number of different utilities for creating animations, music and artwork featuring the Looney Tunes. 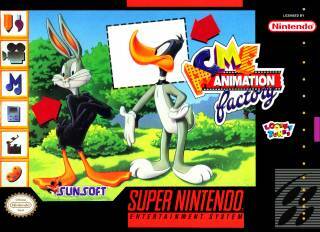 ACME Animation Factory is an art creation program on which players can use the SNES Mouse peripheral in order to paint, music, color, and animate pictures. The game is licensed by and features characters from the Looney Tunes franchise. It was released exclusively for the Super Nintendo in 1994. There is also a video game mode where the player can play Concentration (a.k.a. Memory) with animated Looney Toons characters; this mode has an added wrinkle where the player must avoid "broken" cards that will end the game prematurely if the player uncovers three of them (out of four). The player has a minute to find all seven pairs, and can reset the game with different configurations.